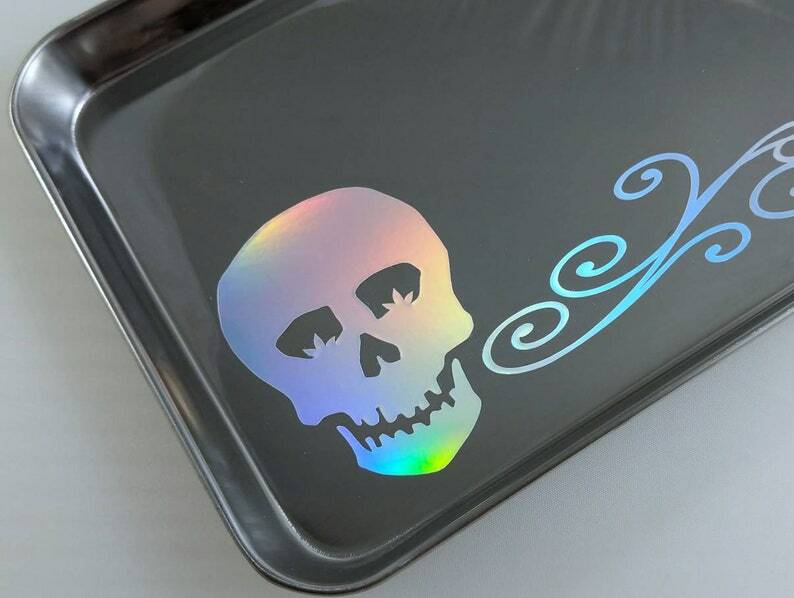 Stainless Steel Rectangle decorative tray rolling tray. It measures 10x6 inches and is .75 inches deep. The smooth, curved corners means it makes a nice tool as part of your rolling tray kit or use it for decoration and catch-all tray. Weighing 161 grams, it's sturdiness allows multiple items to be carried, especially the complimentary jars also available through my shop! 2 jars plus tools are easily carried without bending the tray. Design is commercial grade adhesive vinyl hand placed onto the surface. Tray can be cleaned with 99% alcohol and hot water to bring it back to original luster. Do not put in dishwasher. Custom design from Pretty Trippy Shop. Works very well! And comes in very cute shipping package and box!